Twice the "antioxidant power" of orange juice - you don't say. Um, what exactly is "antioxidant power" and how does it "protect" my immune system? According to the advertisement it has to do with the "Oxygen Radical Absorbance Capacity". Is that an established measure of healthfulness? Of course not. Has it been shown to "protect" immune systems? Of course not. Does that stop Welch's from making health claims to boost sales? Of course not. 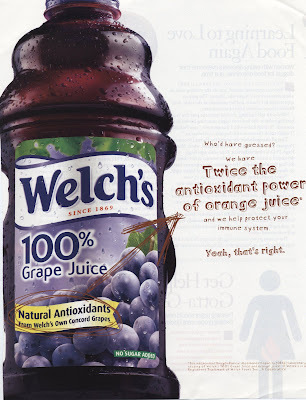 You know what else Welch's grape juice has twice as much of compared with orange juice (and Coca Cola for that matter)? Calories and sugar. And I don't think they protect your immune system.